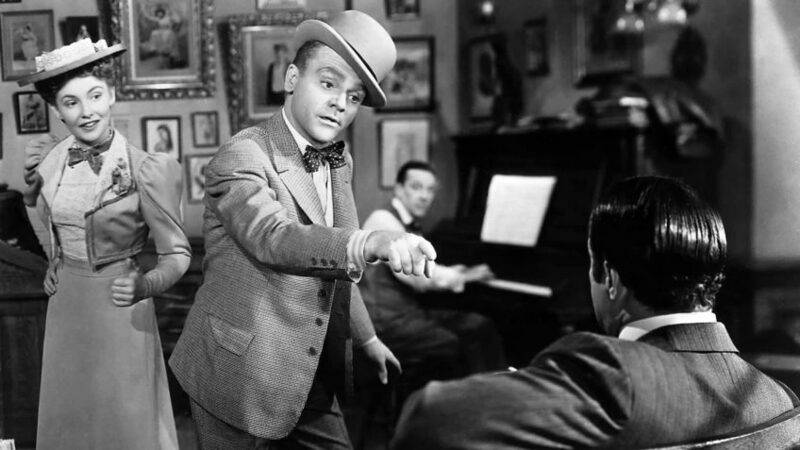 No film in the James Cagney filmography best illustrates what can only be called “The Cagney Conundrum” than does the 1942 Michael Curtiz film, “Yankee Doodle Dandy”. What is “The Cagney Conundrum,” you ask? It is the fact that James Cagney, as a pure actor had such limited dramatic range yet became, arguably, the most versatile actor in Hollywood, if not world, film history. Despite his obvious limitations in size, speech patterns, facial expression, vocal range, etc., Cagney succeeded in doing films that were musicals, dramas, thrillers, comedies, and more. Yet, in every film, he was James Cagney, not his fictive alter-ego. Even more telling is how this actor, who is ALWAYS himself, transcends, and then takes a rather simplistic film idea, like the patriotic to the silliest extreme, whitewashed life of a song and dance man (who had veto power over the film), on his back, pretty damned near to greatness, and well deserving of the Academy Award for Best Actor that he won in the year of its release. No, “Yankee Doodle Dandy” is not a flat-out great film, but, under the genre heading of musical, it’s likely the best offered in Hollywood’s Golden Age, from the 1930s through 1950s, and certainly a genre great, because, even if one removes the song and dance numbers, there are enough well written scenes and moments to lift the film above the hackery that plagues almost all Hollywood musicals. The film starts with a flashback structure, in which an aging Cohan, starring as President Franklin Delano Roosevelt, in his Broadway comeback vehicle, I’d Rather Be Right, a musical satire, by Rodgers and Hart, is summoned to the White House by the ‘real’ FDR (‘Captain’ Jack Young, but voiced by Art Gilmore), to receive a Congressional Gold Medal for his writing of patriotic songs in World War One. The two men then chat for the two hour length of the film (as is told by the clock on FDR’s desk), as Cohan recounts his life to the President, from birth until their meeting. He and his sister Josie (played by real life sister, Jeanne Cagney) join the family business, and they grow into adulthood, touring as The Four Cohans. Rosemary DeCamp and Walter Huston play Cohan’s too lenient parents, Nellie and Jerry. The Two Disk Special edition of the film, put out by Warner Brothers, is a great package. The black and white film is shown in a full frame 1.33:1 aspect ratio, and is given a good clean up job and a sharp transfer. The film’s audio is also well preserved. As for special features, they are spread out onto the two disks. Disk One has the film, and a superb audio commentary, by film historian Rudy Behlmer. While not big on spontaneity, Behlmer’s soothing voice, fastidiously detailed anecdoture, and scene specific comments, make him one of the best commentarians in the now fading Golden Age of DVD commentaries (this DVD set was released in 2003, before the rise of streaming film technology). That, plus his enthusiasm for the films he comments on, can lift even a mediocre film experience into an excellent commentary experience. There are also “Warner Night At The Movies” features, hosted by film critic Leonard Maltin. These include the original trailer for director Michael Curtiz’s “Casablanca,” a newsreel, a short film on citizens’ duty during war, and the Bugs Bunny cartoon “Bugs Bunny Gets The Boid.” There is also a Cagney Trailer Gallery for such films as “The Public Enemy,” “Footlight Parade,” “A Midsummer Night’s Dream,” “Angels With Dirty Faces,” “The Roaring Twenties,” “Yankee Doodle Dandy,” and “White Heat.” There is also a list of awards won and a list of the Cast and Crew. Disk Two has even more terrific features, beginning with a solid 46 minute 1992 documentary on Cagney’s life and career, hosted by actor Michael J. Fox, called “James Cagney: Top Of The World.” An even better documentary is the 45 minute making of feature, “Let Freedom Sing! : The Story Of Yankee Doodle Dandy.” Included in the film are talking heads such as film historians Behlmer, Bob Thomas, and Robert Osborne, producer A.C. Lyles, authors John McCabe and Patrick McGilligan, and actors Joan Leslie, John Travolta, and Joel Grey. There is a brief video called “John Travolta Remembers James Cagney” which is also solid, and reveals the connection between the two actors. There are two Loony Tune cartoons: “Yankee Doodle Daffy” and “Yankee Doodle Bugs.” They have no real connection to the Cagney film save for their titles. There is a 1943 war short, starring Cagney, called “You, John Jones,” starring Ann Sothern and Margaret O’Brien, as Cagney’s wife and daughter. Then there is an Audio Vault containing outtakes And rehearsals, and a complete 10/19/42 edition of the “Lady Esther Screen Guild Theater Radio Show.” Other features are assorted photographic stills, sheet music, and film posters, plus a couple of Easter Eggs that can easily be looked up online. Curtiz does his usually solid, if uninspired, directing, and the screenplay, by Robert Buckner, Edmund Joseph, Julius J. Epstein, and Philip G. Epstein, is also solid, filled with a number of Epstein bits, inspired by Cagney improvs. The best example of the screenplay shining through comes in two paired scenes: midway through the film, when George gives Mary’s song to Fay and Mary says she realized that he had done that when he walked in with flowers and candy. Cagney winces that he’s been had. Near the end of the film, when Mary says she got a call from Harris, asking for George to star in the FDR show, he lets her go on persuading him, only to admit that he listened in on the other phone. Touché. The film score, by Ray Heindorf and Heinz Roemheld, is, as to be expected, sterling, and the cinematography, by James Wong Howe, is solid throughout the 125 minute running time. “Yankee Doodle Dandy” is not great art, but it has great moments peppered throughout, along with huge helpings of wince worthy schmaltz. The one thing that it has solidly in its favor, though, is “The Cagney Conundrum,” and the film thrives off of it. So does the viewer, for art is not always the product of great ideas and execution, but the ineffable, and that is the quality that James Cagney had and was. Don’t even try to argue.